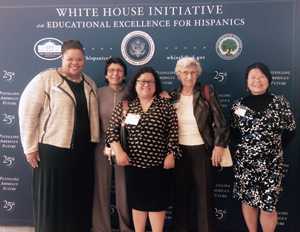 With data pointing at the Latino population quickly becoming a majority minority in the nation, a recent symposium held in Chicago by the White House Initiative on Educational Excellence for Hispanics highlighted the ways in which early learning can help support this growing population. First 5 LA Best Start Program Officer Maria Aquino was one of about 100 representing child and early learning advocates who attended last month’s 2015 Early Learning Symposium, entitled Fulfilling America’s Future: Research. Practice & Policy Advancing Early Childhood Education for Hispanics. Dr. Luisiana Meléndez, Clinical Associate Professor at Erikson Institute, shared that one way we can accomplish this is to have culturally relevant and bilingual education that builds on the assets of families. Dr. Meléndez highlighted the importance of culture and family in a child’s life in order to adequately address needs in a holistic way. There is also a need to raise awareness of culture and context with early learning practitioners and to increase the proportion of practitioners that reflect the background of the families they serve. Dr. Ida Rose Florez, Vice President of the National Association for the Education of Young Children and Director of First 5 California’s Early Education Effectiveness Exchange Learning Academy, reminds us to see that from a child’s experience entering school, we can understand that they are thrust into a culture that is unknown to them, as it is not the one at home. Policy can guide change in teacher prep and licensure. Dr. Florez brought Quality Rating and Improvement Systems (QRIS) into the conversation, urging us to see it with a cultural lens and to value bilingualism. She recommended that we ask ourselves what we are missing with QRIS, continue to question its validity and be careful not to hang everything on it. Instead, we should be working on making it meaningful and assess how to show multiple levels of quality. Lastly, we should also ask ourselves who is creating assessments, because they are the product of people who create them, so they need to reflect the diversity of the students. In addition to seeing families with a cultural lens, speakers on the subject of family engagement recommended that if we want to see better outcomes, we must engage communities and families. This topic spoke to the potential of the work that First 5 LA is doing through its 14 Best Start Communities. This look at community and family as playing a major role in creating positive outcomes on children is aligned with the goals of First 5 LA’s new Strategic Plan, which recognizes the need to build coalitions to comprehensively address these challenges. Linda Smith, U.S. Deputy Assistant Secretary and Inter-Departmental Liaison for Early Childhood Development, added that engaging and coaching parents on these issues so that they can demand more for their children is the activism that is necessary, as a unified voice on these issues will have to engage all levels of government.